It’s been hot this summer. Like, really hot. The kind of hot that you hope for on holiday, but which just makes everyday city life unbearable. Luckily, Basel has the solution (and this time it’s not ice cream). As the mercury rises, Baselers sink. Into the cool waters of the Rhine. Sunny summer days see the river filled with bright, laughing dots as people gently float downstream. The secret is to jump in at the Germany-wards end, then let the river do the work. 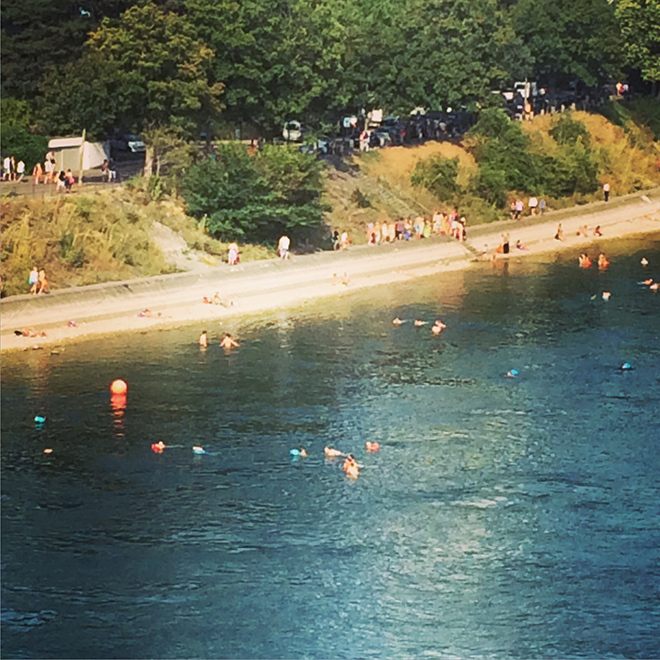 The Rhine has a strong current flowing downstream which means you can basically float along until you want to get out. In fact, trying to swim against it is futile, you might think you’re moving, but take one glance towards the banks and you’ll see that the current is king and you’re travelling in exactly the direction it had planned for you all along. To aid this floating journey, most people rely on a Wickelfisch. This isn’t some kindly, fairytale-like Rhine creature, it’s the iconic brightly coloured, fish-shaped, waterproof bag that you’ll see the majority of swimmers carrying / wearing. If you pack enough air into it along with your clothes, it acts as a kind of cushion. It’s not a floatation aid, and it’s a good idea not to get the fastening underwater, but it definitely makes the swimming experience more summer holiday and less summer Olympics. The Wickelfisch (or any other waterproof bag) is also handy for transporting your stuff if you’re not renting a locker at the Rhinebad Breite. People tend to just jump in anywhere, and as you’re immediately moved along by the river, it’s helpful to have a way to carry your clothes so that you can get dressed before you have to walk home. Most people are just wearing regular swimwear, and the water is pretty clean although a little chill. It’s hardly unbearable however, and one giant leap in is all it needs to acclimatise. Take the plunge at the St Alban Rhine ferry boat station on the Klein Basel bank (or wade in a little further downstream where the river comes into the shallows, and float down. Just before the next ferry pier, the banks once again slope into the shallows, making it easy to swim to shore. But plan ahead, it can take a couple of metres to swim across the current. Despite this, the current is not that much of a concern for anyone who can basically swim. It just goes in one direction, and you can cut across pretty easily to get the the bank. There are a few areas where you have to swim out into the centre of the river to avoid buoys, bridges or other obstacles, but it’s not worrying at all. I don’t really like swimming in deep river or sea water, but I never felt unsure. The Wickelfisch helps. He has a kind face. Where to buy a Wickelfisch: If you want to look like a local you need your trusty aquatic companion. ‘It’s very Basel,’ I was told as we went in search of one. Pick one up at Bidder & Tanner bookstore on Aeschenvorstadt, Thalia on Freistrasse, or from the St Alban ferry. Good to know: Bachapp goes you real-time air and water temperatures and pointers on the best swimming spots. I won’t go into too much detail as My Little Basel describes it here. Revive yourself: At one of the riverside bars and cafes that open in summer on the Klein Basel bank. Coffee, cakes, drinks and snacks in the sun. Next Next post: HOW IMPORTANT IS ACCENT WHEN LEARNING A LANGUAGE?